Is anyone else getting so excited that fall is around the corner?! One thing I love most about the cooler weather is enjoying delicious seasonal foods and drinks like hot cocoa, addictive pumpkin spice lattes, or really anything pumpkin related like my Pumpkin Chocolate Chip Muffin Top Cookies + Coconut Frosting, or these Pumpkin Cranberry Crumb Mini Muffins (both recipes are vegan and gluten free!). The thing is, these yummy fall drinks that we all love to get at our favorite coffee shops are typically loaded with huge amounts of unhealthy and artificial sugars, fake colorings, GMOs and more icky ingredients that I imagine none of us want to put into our bodies (or the bodies of our children!). Additionally, those hot chocolate powder packets you buy in the store also contain tons of unhealthy sugars and additives, and really – to me anyway – don’t even taste very good. That’s where making your own seasonal drinks comes in, and it can be fun for your kids too! 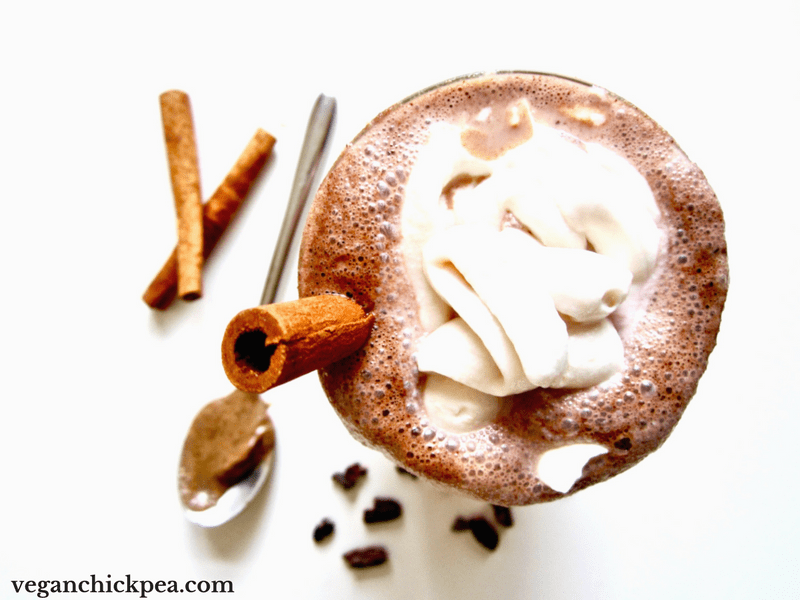 This Spiced Hazelnut Hot Chocolate is warming and rich enough to feel satisfying and perfectly balanced, without the heaviness of those standard hot chocolates you get at coffeeshops, drive thrus or from paper pouches. Homemade not only tastes better, but it’s much healthier too! This particular recipe is only sweetened with unrefined sugars – your choice of date syrup or maple syrup – so you can drink it without guilt. The hazelnut butter delivers a nutty, toasty creaminess, and hazelnuts are known for their antioxidants and promoting heart health. 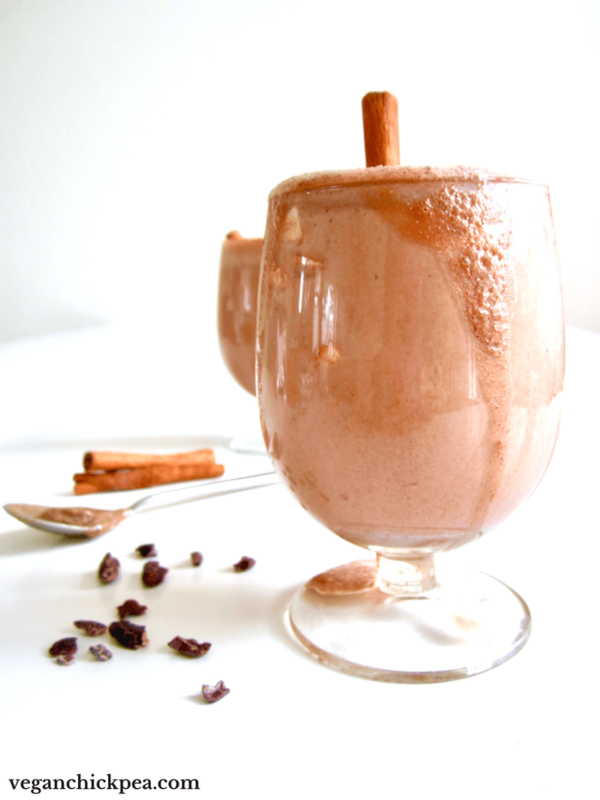 The cinnamon and nutmeg give an uplifting, energizing aroma; the raw, unsweetened cacao powder is a superfood that has antioxidants, contains a mild stimulant that has feel-good effects, and supports a sense of alertness. It really is the perfect treat for a cool autumn afternoon, a freezing cold winter night or lazy Saturday morning! I’m a newbie when it comes to essential oils and recently made this DIY Facial Moisturizer that I’ve been loving. I’ve since learned that you can eat and drink essential oils that are food grade approved – how cool is that?! I immediately wanted to learn more about it and test this out for myself. Essential oils have a myriad of health benefits that your body can utilize when you use them in your food. In this recipe I used Young Living’s Cinnamon Bark and Nutmeg oils, which I really enjoyed because ground cinnamon and nutmeg can be hard to dissolve, so the flavor doesn’t get dispersed evenly. That means you end up with a big mouthful of spice as you take your last sip from the mug – not so enjoyable! Here are some of the health benefits of adding these essential oils in your diet (according to Young Living’s site) and ways you can use them. Essential oils provide incredible flavor to food with just ONE drop of oil – so don’t overdo it! The oils have a long shelf life and can last for years, potentially making them more cost effective in the long run than fresh herbs and spices that spoil faster. Leave out the essential oils for young children or picky palettes. The oils are multipurpose – they can be diffused as potpourri and aromatherapy, added to base oils like coconut or avocado and be applied topically, or added to your DIY cleaning recipes. Keep these oils in your purse when you’re out and about and add a drop in your favorite unsweetened latte – thus getting all the warm, energizing fall flavors without the sugar and additives! Add all ingredients to a blender. Blend to get frothy! Heat on the stove until warm. If desired, top with whipped cream and a cinnamon stick straw - this makes for a delicious and fun finishing touch! 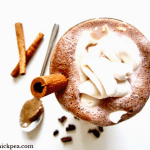 You can omit the essential oils to make a more traditional hot chocolate. 1) In place of the oils, you can substitute approximately 2 tsp ground cinnamon and 1 tsp ground nutmeg. 2) For hazelnut butter, you can substitute almond or cashew butter. 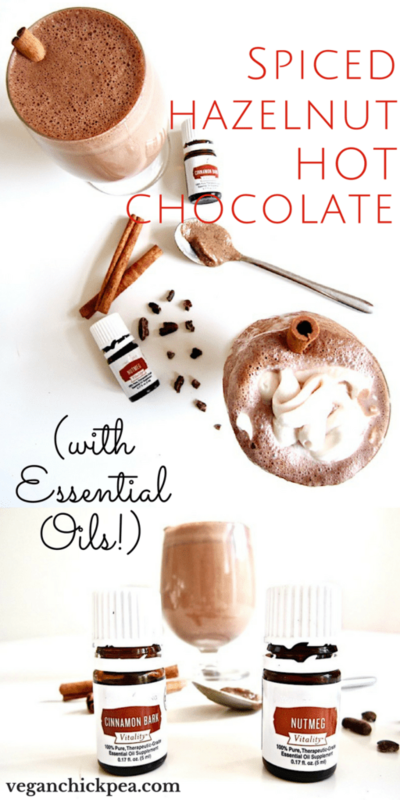 I hope you enjoy this recipe and exploring all the benefits of essential oils. If you want to learn more about how to incorporate essential oils into your daily life, then join us in the FREE 10 Day Chemical Freedom Challenge here! Sarah Newman is the creator of Vegan Chickpea, a site sharing delicious vegan, gluten free and clean eating recipes along with lifestyle tips and travel reviews. The site isn’t only for plant-based eaters, but welcomes all those who want to integrate more health, wellness and sustainable choices into their daily lives. Make sure to stop by for healthy recipes or say hello on social media!